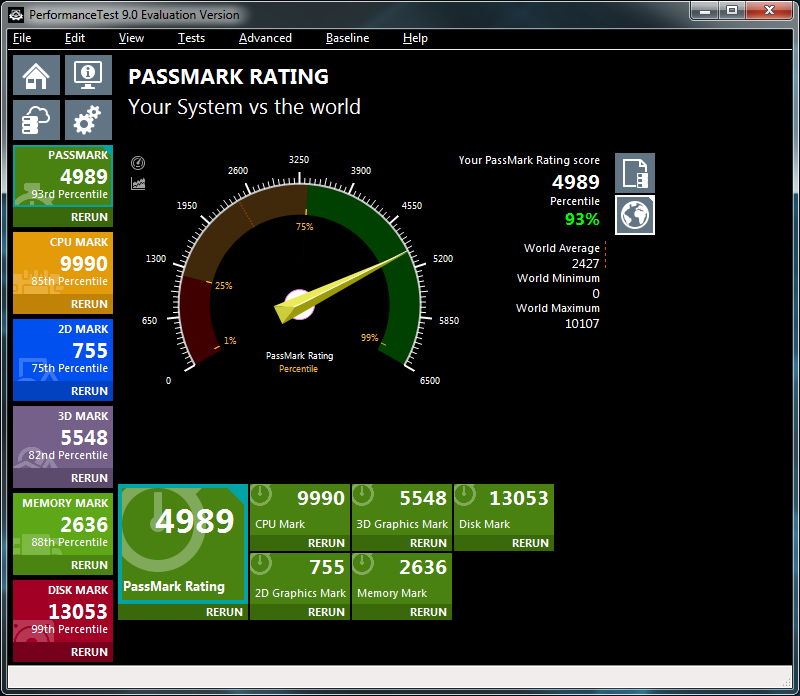 Some years ago Jonners put together a blog post showing some basic machine benchmarking scores using CrystalMark 2004. Being the competitive/curious fellows we all are, over a little while various friends and colleagues submitted their own scores to this post and it became a light-hearted competition (no-one actually put their machines together for this purpose, we are not that sad, but it did serve as an interesting way to compare them). Some of them are there to serve as a reminder how far things have come with no expectation of a high score, some of them show how actually even 5 year plus old CPU’s such as mine and Shaun’s are still more than capable today (both scores are without the over-clocking the k edition is more than able to take). While as I write this I am top of the table, my PCIE M.2 SSD is a major reason for that and if others were to do something similar my score would be left behind by a number of them. 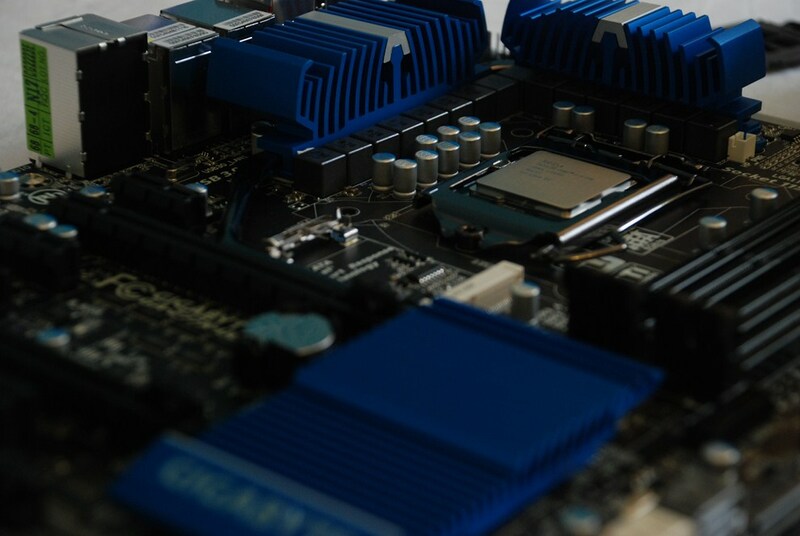 I did however due to the age of my hardware have to go through the pain of adding a new module into my BIOS in order to get that drive to boot, so it was not an upgrade for most without a whole new motherboard/architecture. For me the most interesting take home was that my new laptop is actually at a level of performance that I consider to be fairly close to comparable to my desktop. While clearly my desktop is getting on a bit in computing years, it is still very able. It just serves to demonstrate that laptops really have not stood still, especially in this most recent round of upgrades from Intel. It is now within sane reach to have desktop performance (minus graphics, although that is an option for larger laptops) in a very portable package. 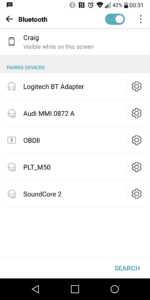 Other benchmarks welcome, these were all done with version 9 of the trial. I have been knocked off my top spot thanks to my brother Andy. 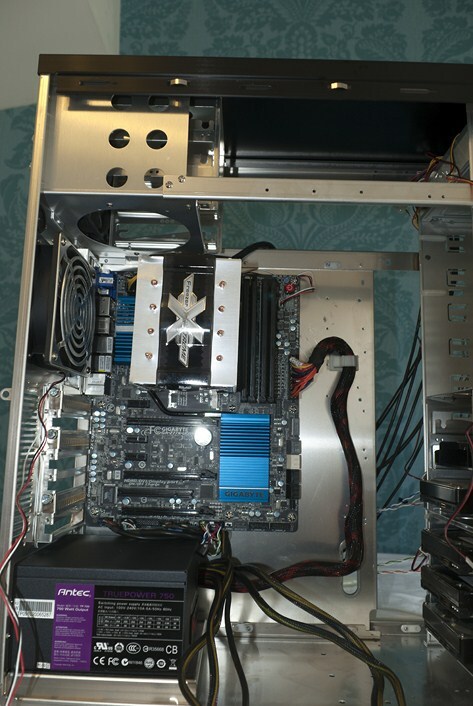 His build is an example of what happens when you throw down a huge pile of cash and see what happens. For me the CPU is very impressive, but for my money Ryzen is much better value, as shown by Jonners v2 and Rick. Last weekend when going to a concert/event at the church in Truro I saw a “prop” for lack of better description built by a friend which got me thinking. It was wooden cross with LED lights inside and a DMX controller to hook it into their lighting system. 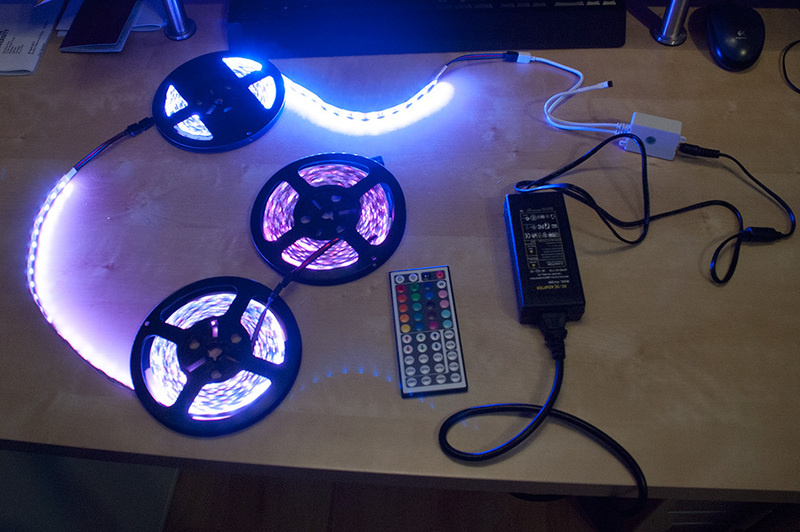 Specifically they were not just any old LED lights, but a tape strip with RGB LED’s all the way along. While this is not a new idea to me; it was the first time I realised they were simple enough that I could do something with them. 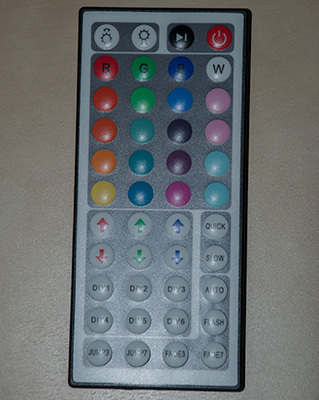 Years ago I saw people messing around with these things in their homes creating all sorts of lighting effects. While very cool (in my eyes at least) it seemed a little out of reach. They were all building custom controllers using more knowledge than I have. 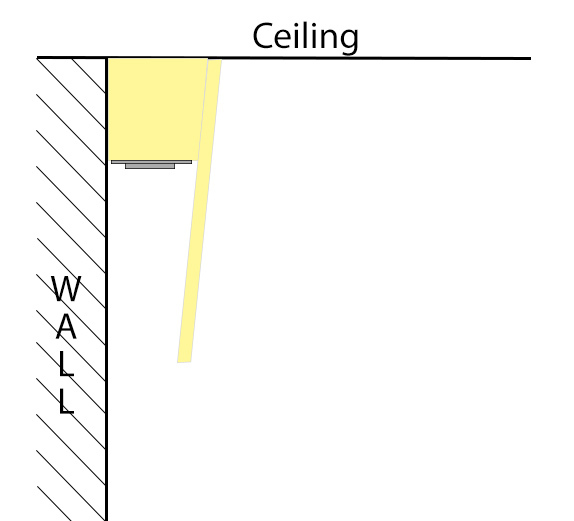 The cunning plan is to put some edging round the ceiling of the lounge and stick these to the underside so they point down the walls on 3 sides of the room. 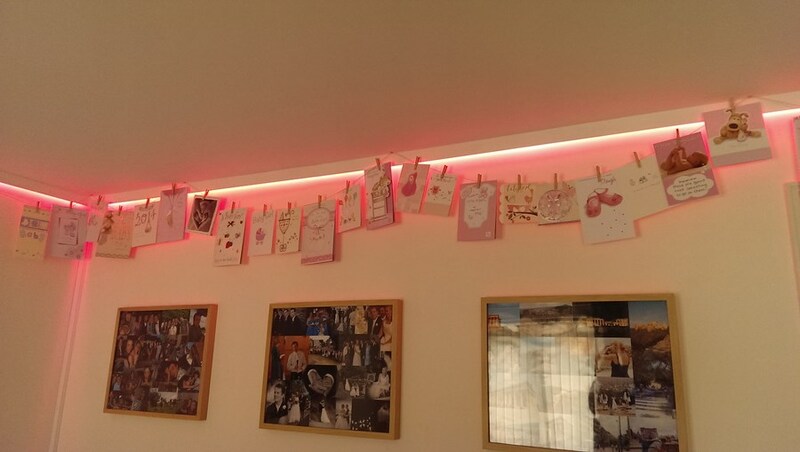 Thanks to our walls being white this should let us change the colours of the walls as well as light the room up a little better. 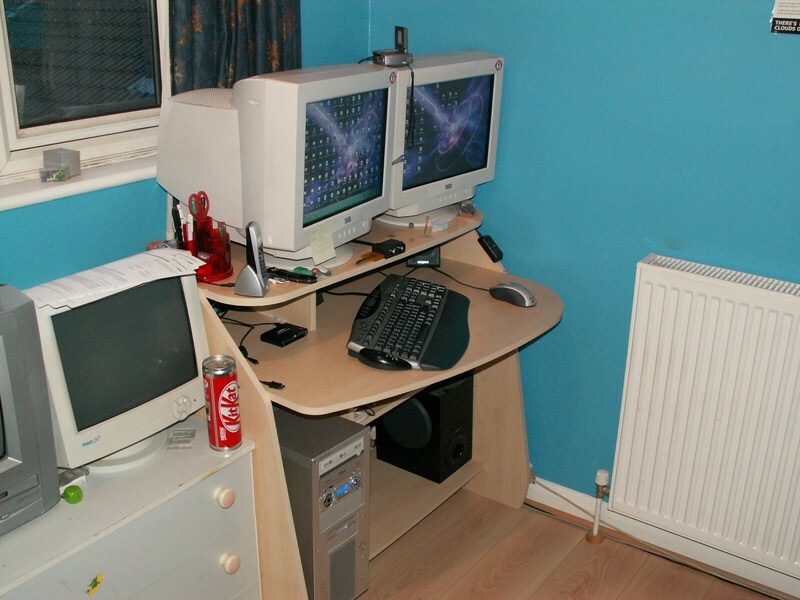 I recently saw a blog post showing how someone’s desk and computer setup changes over the course of 10 years. 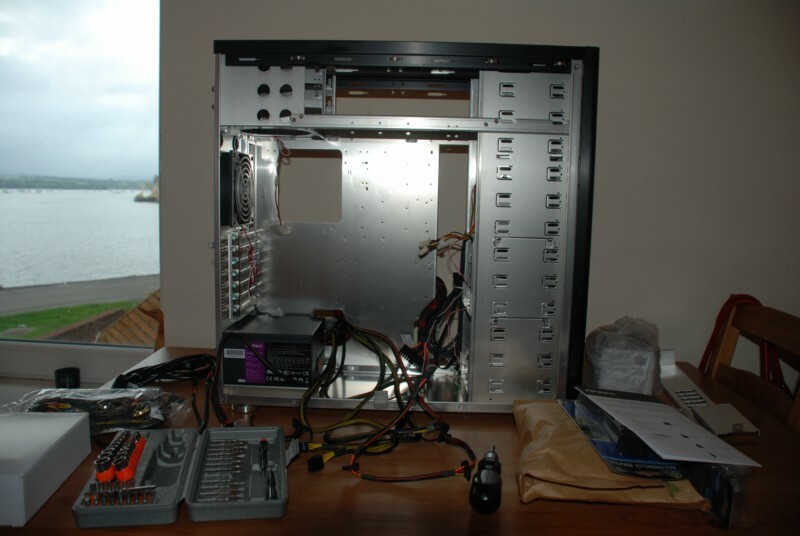 While I have only been running my own machine since 2005 I thought it might interesting to go back and look at what I used to work with. 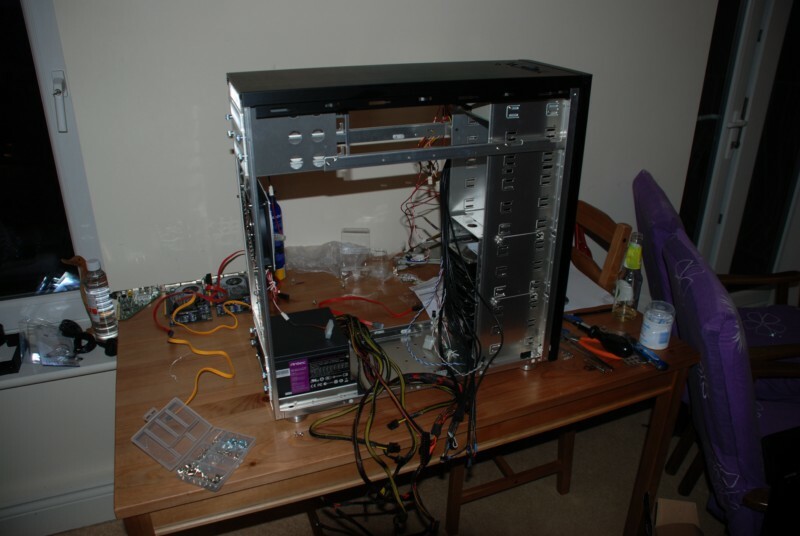 The only unusual thing is that when I first built my machine I was running dual CRT’s. If you keep out of a few specialist industries almost no-one was doing this (I have Thomas to blame for putting the idea in my head). 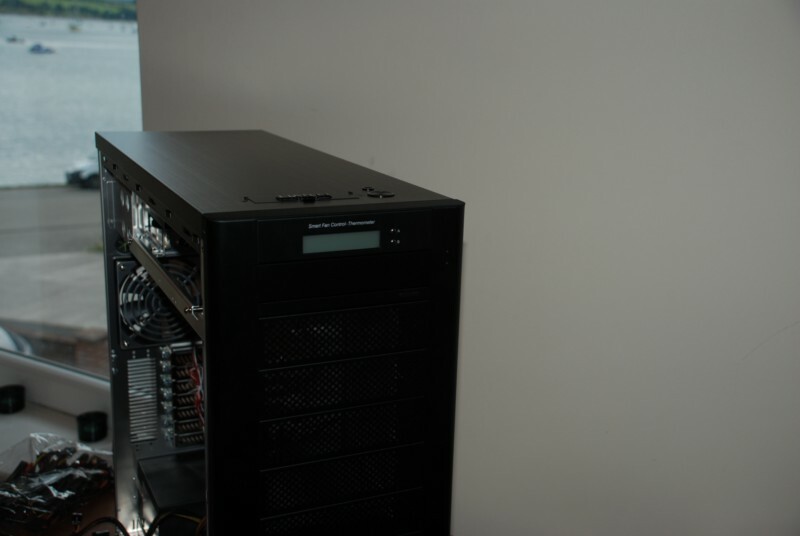 This is the original setup (AMD64 3500+, 2GB of RAM, 2 160GB disks in RAID 1 and a Gefore 5900ultra for those who care). 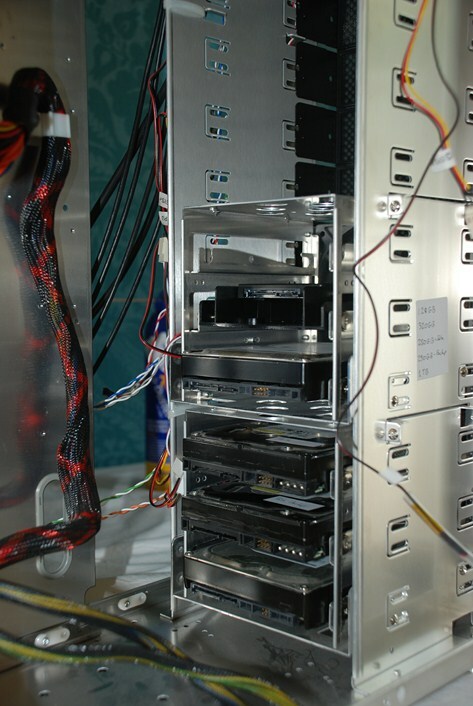 I ran that machine for just over a year before upgrading the RAM and adding a pair of 250GB disks. 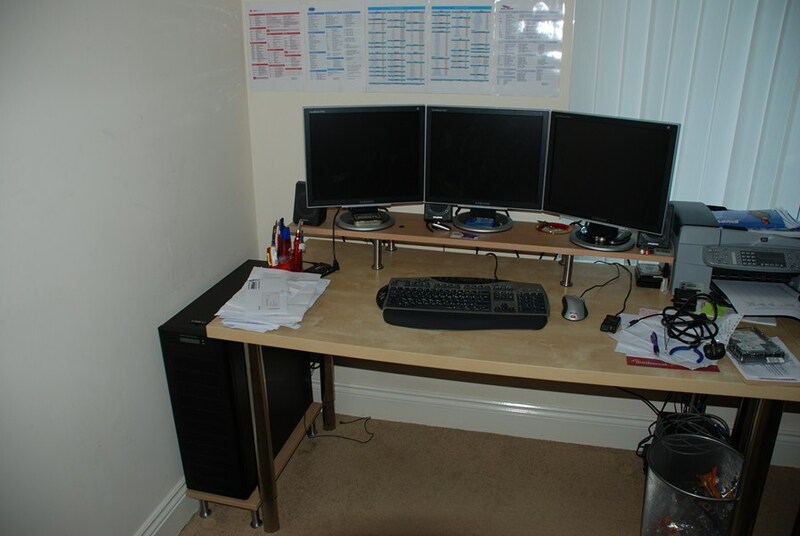 Then another year after that I decided 2 monitors didn’t cut it anymore and CRT’s were far too large, heavy, power hungry and hot so I bought 3 new TFT’s. At the same time I friend built a custom desk for it to hold the monitors. Clearly I was less minimalist back then. 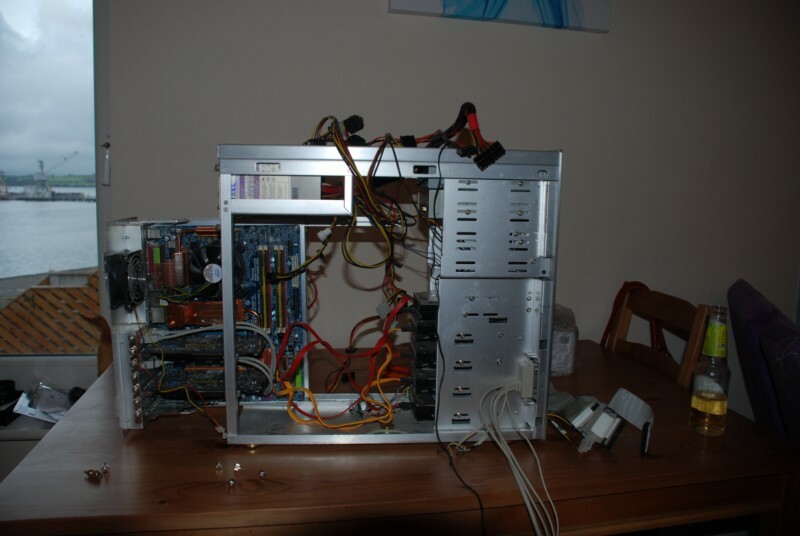 Unfortunately I only had a single graphics card then so I could only run one of them. 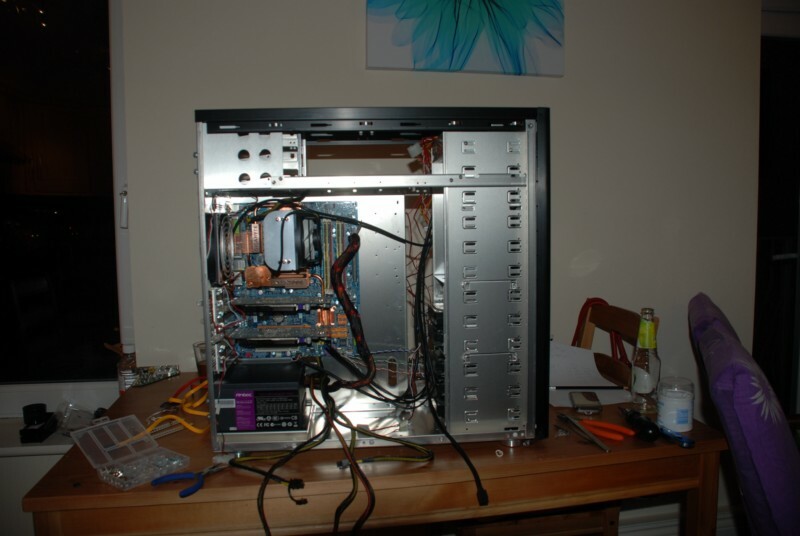 Just before moving to Brighton I upgraded the core of the machine to have an Intel Q6600, 4GB of RAM, a pair of Geforce 8600GTS’s and a further 320GB disk. This is that machine in situ in Brighton. Another year, another location, still Brighton but we moved house. Same desk and same basic machine. 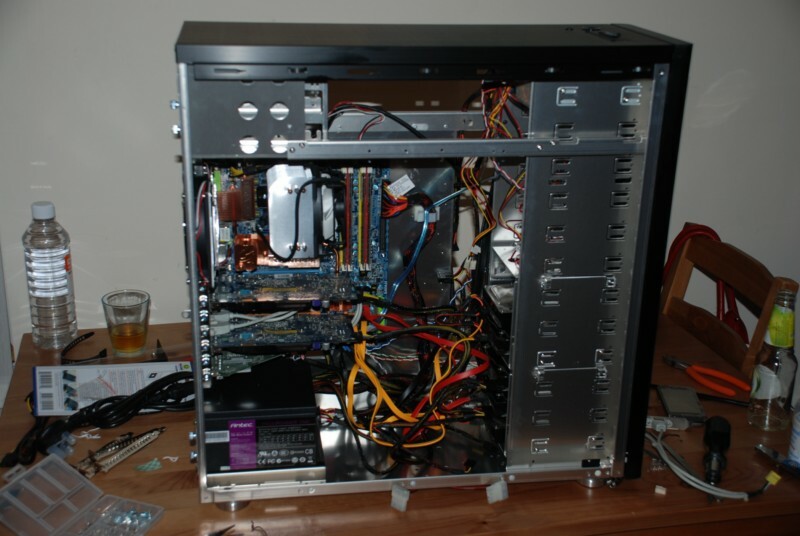 At this point heat started to become a real issue with all that hardware packed into one machine. Then after another year in Brighton I moved into a flat in Plymouth with Demelza. Finally the machine made it out of my room and into a study. I’m not sure why one of the screens is off, I seem to remember it went through a few weeks of not working correctly. 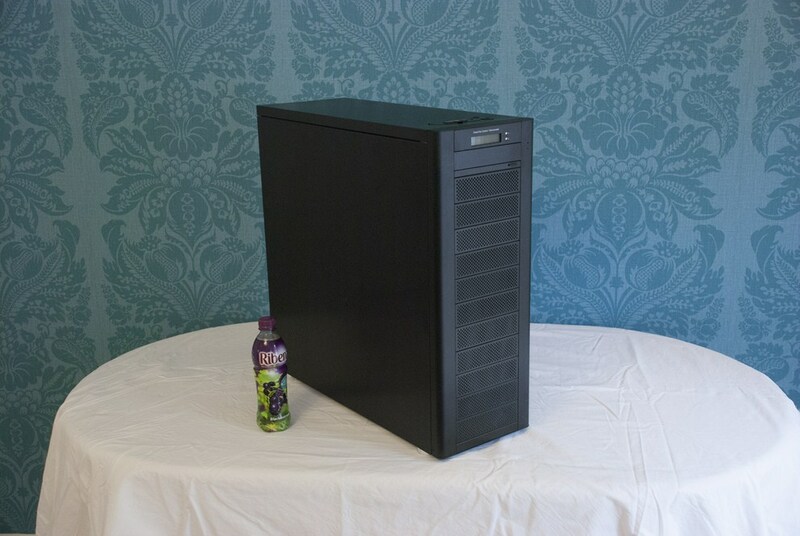 Having put up with the overheating issues for long enough I finally bought the huge case I wanted and moved the whole machine to that. I did at the same time install a new CPU cooler and PSU as well as build a monitor stand to get them back to the right height. 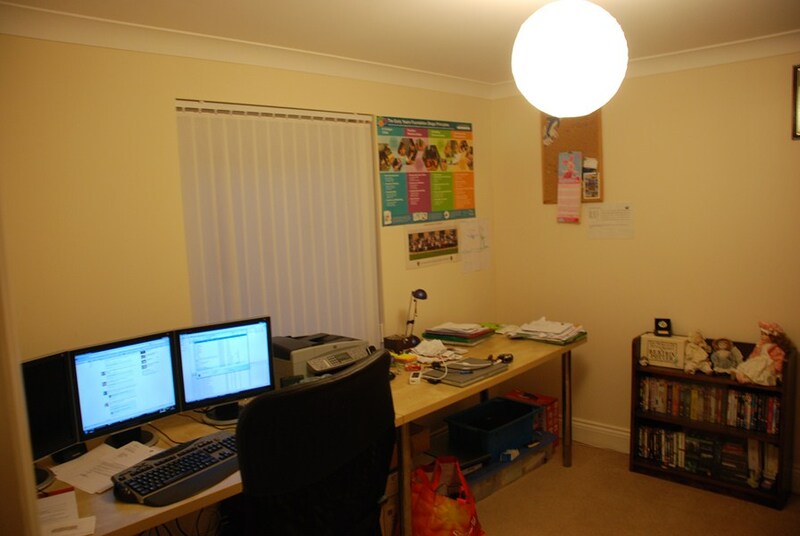 Then we come to today where we have moved into our house and have a different study. The machine looks the same on the outside but underneath has become an i7 32GB monster with a primary SSD for good measure. 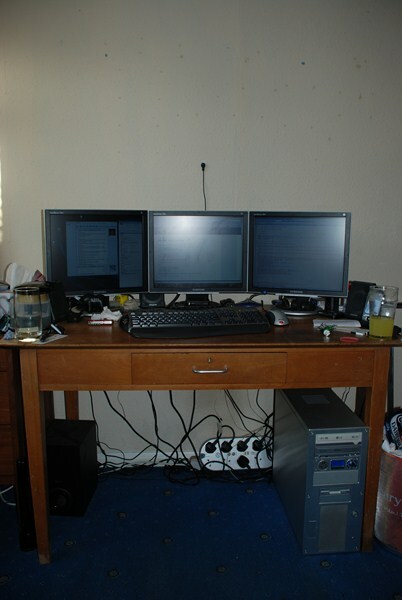 As to where it is going next… Well, the monitors will be the next thing to change. 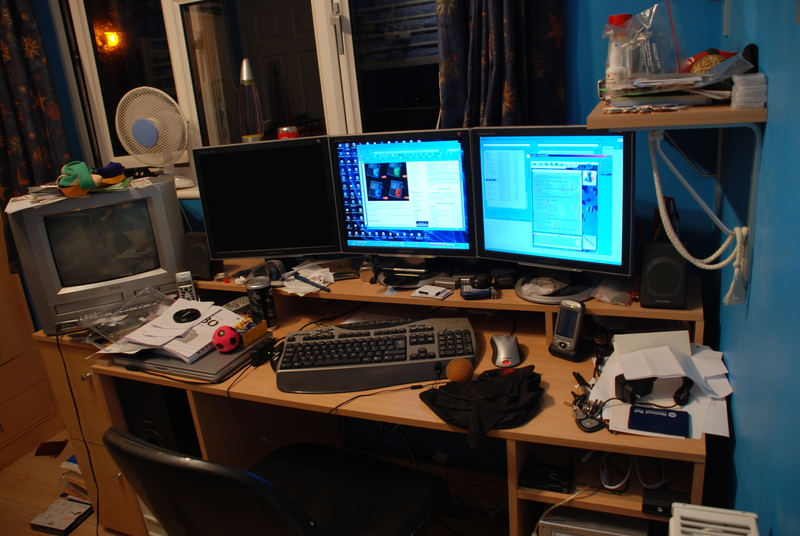 Having worked with 3 monitors for years now I can certainly say I am ready for more. The plan is to move to 4 main working monitors and perhaps use one of the old ones as a status monitor on the right. 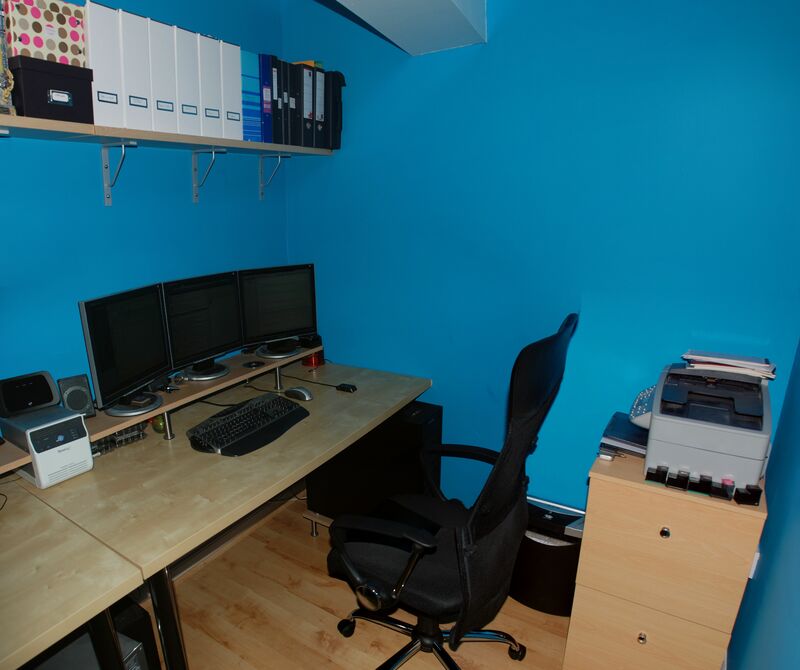 Who knows though, I am always looking for better ways to change my workspace to make my life easier… it just happens that more monitors is the solution that has worked thus far. Recently I wrote that I had finally changed lanes on the broadband superhighway and this was as to be expected, great. However there was a little bit of a nagging issue over (rather unusually) the upload speed. The download speed of 65-70Meg was great, no issues there, but the upload speed of 1.5Meg up ish was a little less than the more like 10 I was promised. With this in mind I called BT to ask what gives. 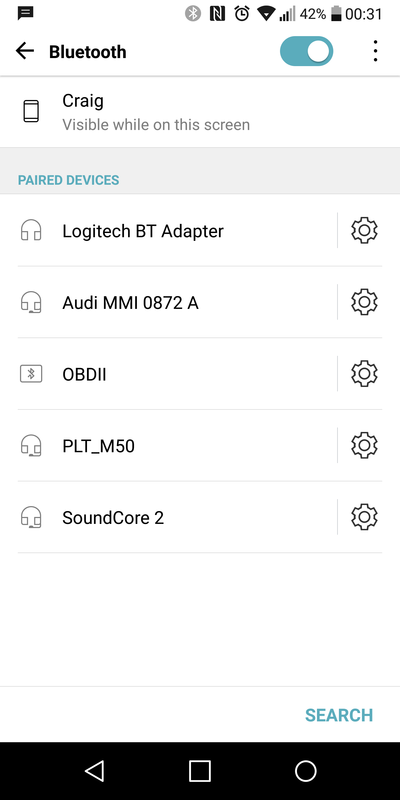 What follows is the call/event log I kept during the issue. Friday 18th May – Fibre installed. 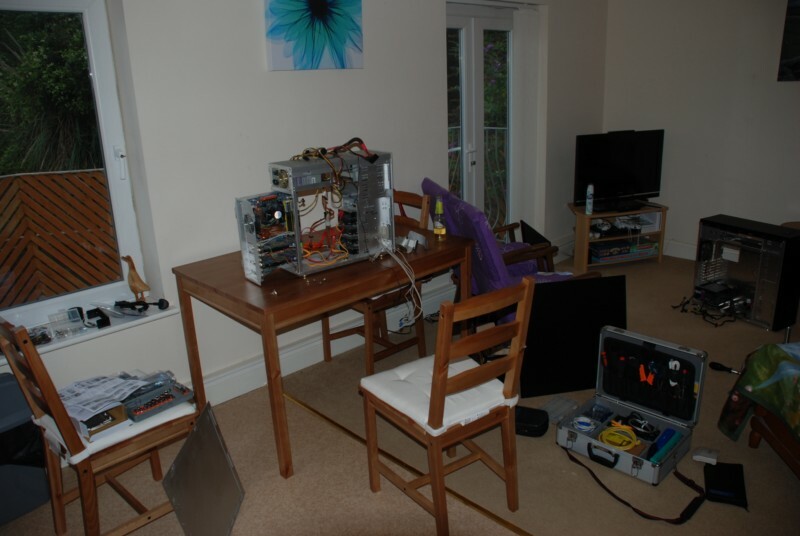 Friday 1st June – Engineer came out, was told the engineer wouldn’t need to visit the house, he came to the house, called and then left as no-one was in. Sunday 10th June – case was re-opened not by me but BT. Saturday 16th June – Engineer came round and confirmed same issue. Sunday 17th June – BT tech support started to raise issue further, started talking to Iain. Saturday 23rd June – Engineer tried to come round, was out (were never asked if this call would be OK). Engineer also confirmed same issue at the cabinet. Monday 25th June – After 24hours no change, spoke to Iain and he is pushing the issue again. Tuesday 26th June – Text from BT saying the issue has been closed. No speed change as yet. Wednesday 27th June – Called to confirm issue not closed. BT confirm this and it is still being chased. Saturday 30th June – Evening – They have said they need to send an engineer to try a reset of the profile from the cabinet, if that fails then engineer will do a lift and shift. Their calendar was not working to book one in, said they would ring back, didn’t. 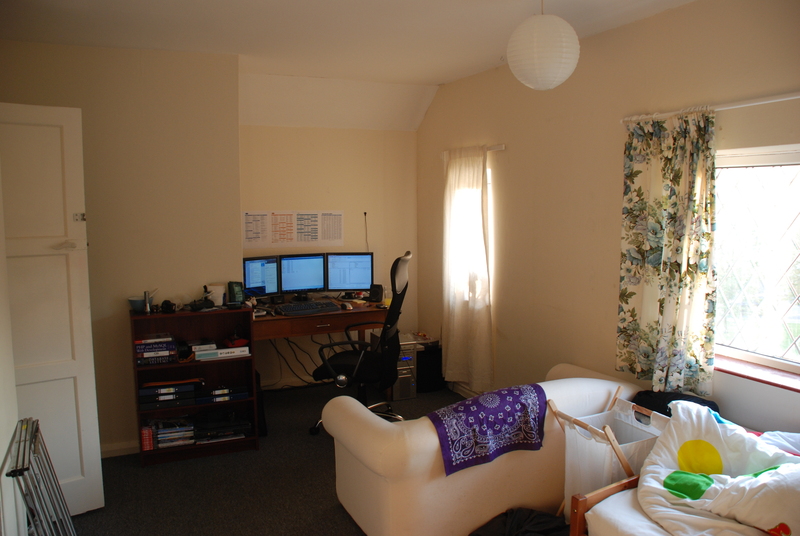 Sunday 1st July – They decided we don’t need an engineer visit to the house and are sending one to the exchange. They also claim that they will do a lift and shift “if needed”. I don’t hold out much hope. Tuesday 3rd July – Call-back in the evening asking if there was a change. Speed test confirms slightly faster upload but nothing amazing and certainly not fixed. They are going to ring tomorrow when the exchange engineer should have visited. Thursday 5th July – Called at 9:30am. They said an engineer should have called at the exchange on the 3rd so they are going to ask them what happened. Going to call back in half an hour. Sunday 8th July – No call back on the Saturday (massive surprise). Called first thing and asked for an update. Said they would get a support engineer out (open reach) to the exchange. Tuesday 10th July – Call from BT saying the work had been completed and to let them know if the issue was still there. They completed a lift and shift. 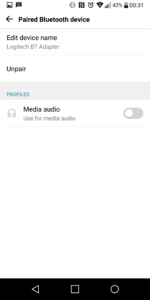 Wednesday 11th July – Upload speeds now at around the 7-8Meg. For those not counting that is 7 engineers (1 install, 2 exchange, 2 failed (although one of them then went to the exchange) and 2 to confirm the error. Total time to resolve the issue was 40 days. Now don’t get me wrong, I’m only kinda complaining. BT did say this was a very unusual issue from day one. Most of them had real trouble comprehending that this was an upload speed issue and not a download issue. The tech’s I spoke to were bar one all very good and helpful. The biggest issue during the whole process was BT’s internal communication between the tech teams and their engineers. Everyone understood the problems they saw, but every time new things about the issue were learnt there was trouble getting that information back to the right people. Last weekend I finally got around to updating the core internals of my machine. I normally follow a tick tock upgrade model where I do a major upgrade and then a minor. 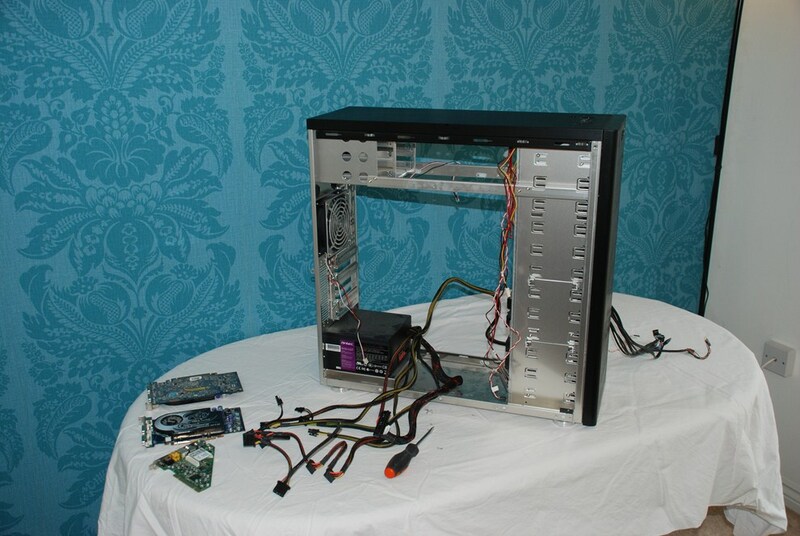 After the minor of new case, PSU and CPU cooler of last time this was the more substantial upgrade of the CPU, motherboard, RAM and the addition of an SSD. I decided there was little point in doing graphics this time as I’m no gamer and I had all I needed. This first photo is simple for scale. The bottle is a 500ml one. 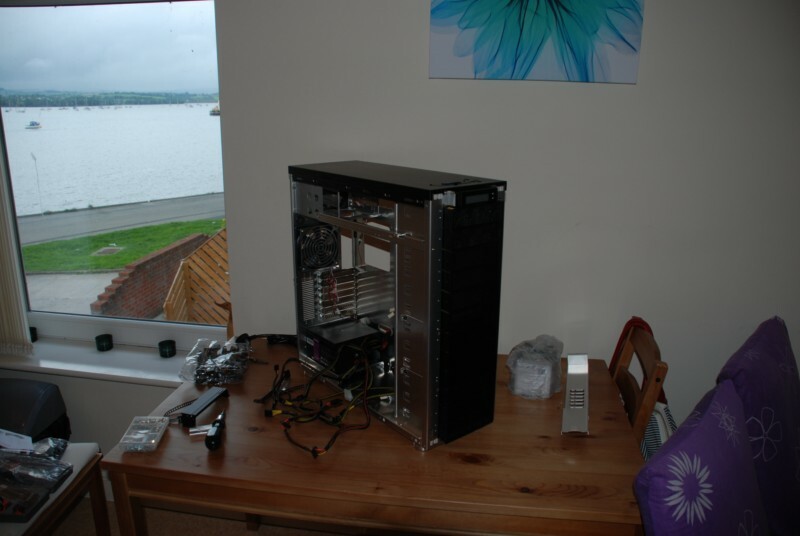 This was the machine as it was before I started work on it. 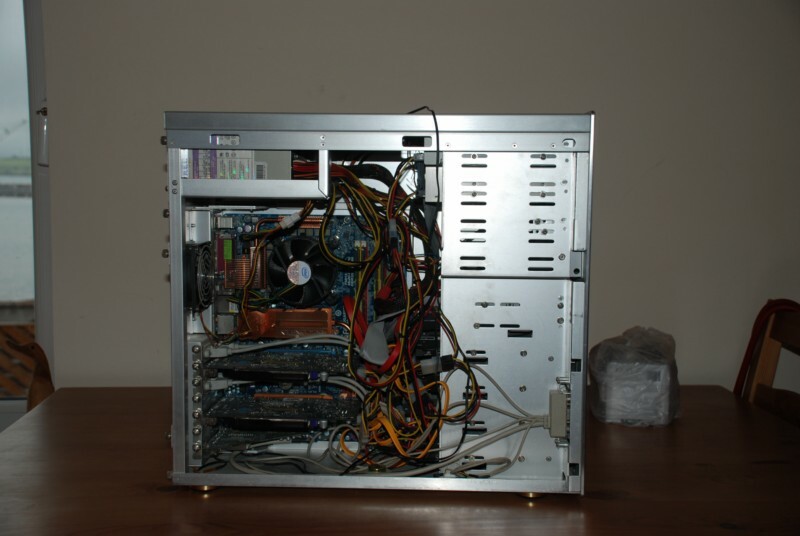 This is the back of the machine as it was. And all opened up ready for me to start taking things out and cleaning them. 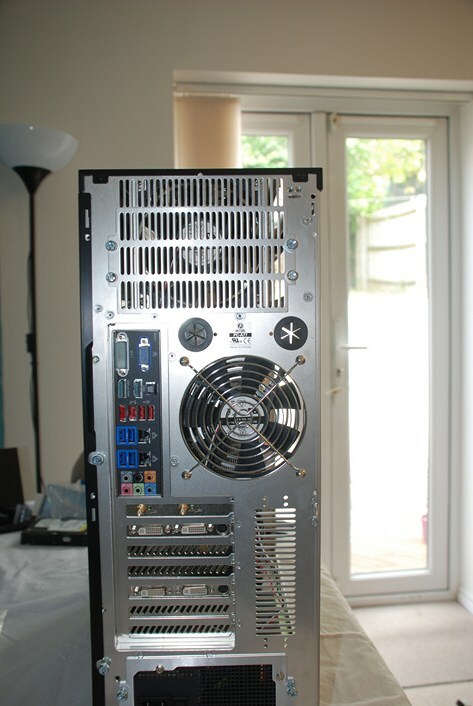 This is having emptied the TV card (which I really had forgotten was in there and explains why I couldn’t find that for my dad recently), graphics cards and the motherboard tray. 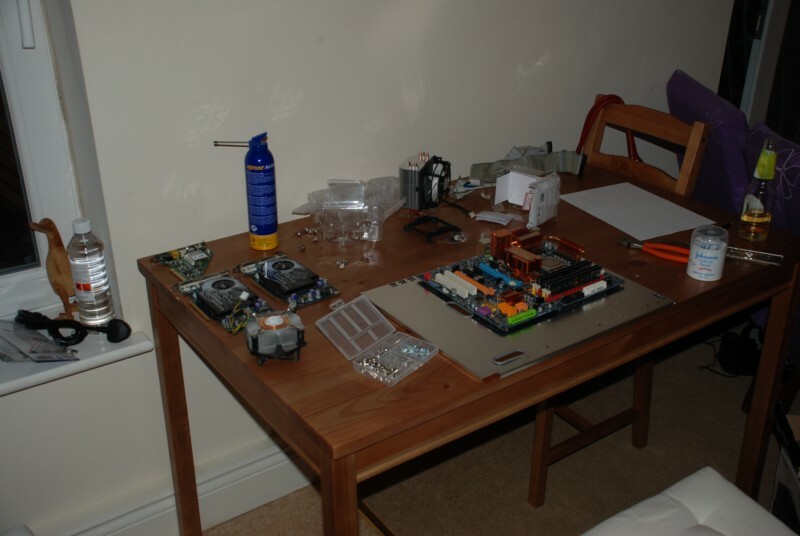 The whole process of removing all the old components and cleaning them took about 45mins. This is now mid build. 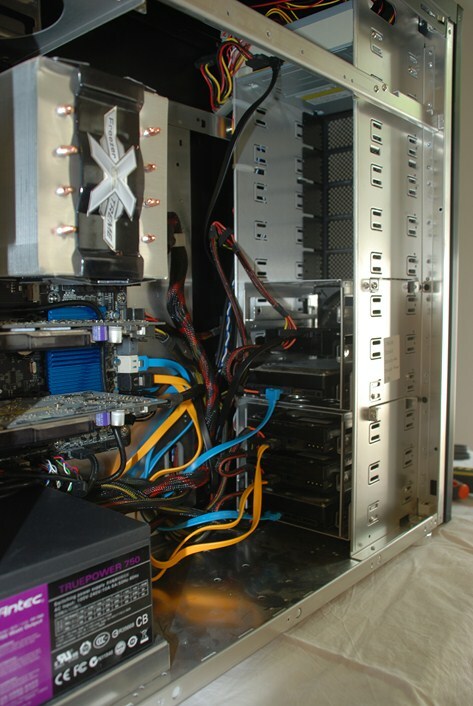 You can see all the old disks lined up on the right, the old motherboard setup at the top and the new one at the front about to have the CPU cooler on it. 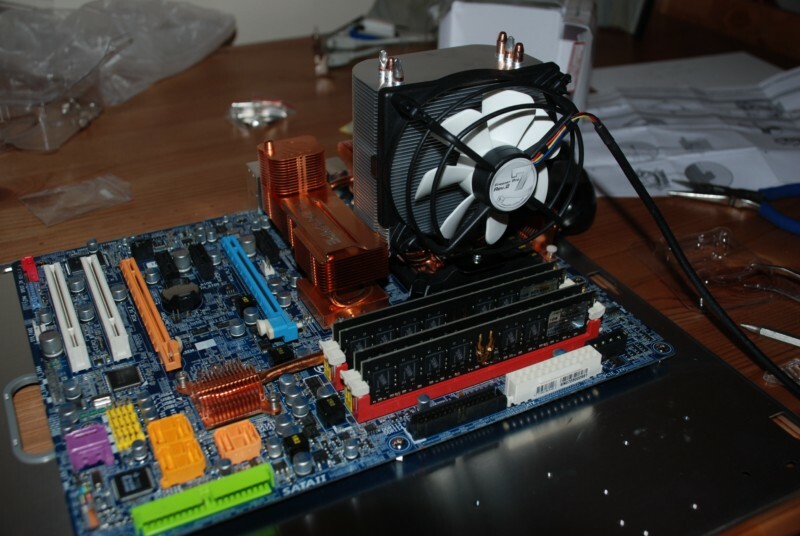 Now with the CPU, cooler and RAM (all 32GB of it) in place. This time round I wanted to do a bit of a better job regarding the cables. While this case is huge and really air flow is never an issue, I wanted to try. 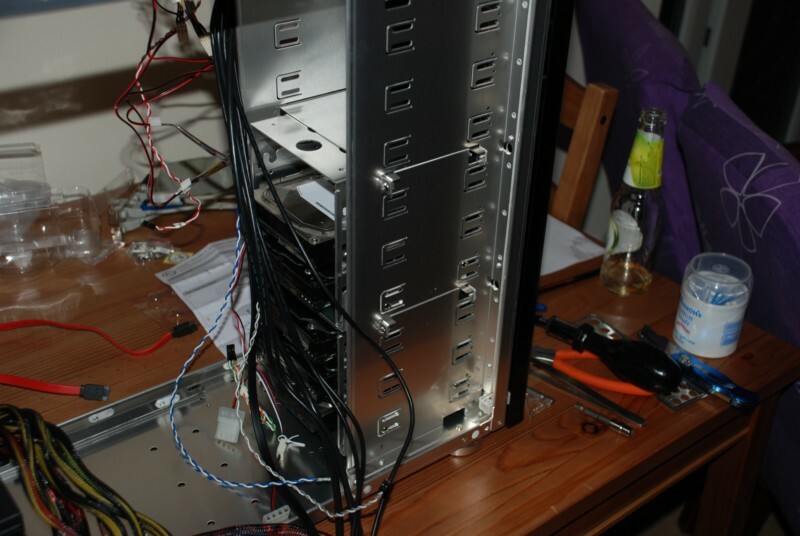 In fact the hardest thing about this case is the sheer length of some of the cable runs needed. At this point all the drives were in place (note the one mechanical left out (This was the last of the 160GB drives from my original machine)) and I was just starting the back cable runs. 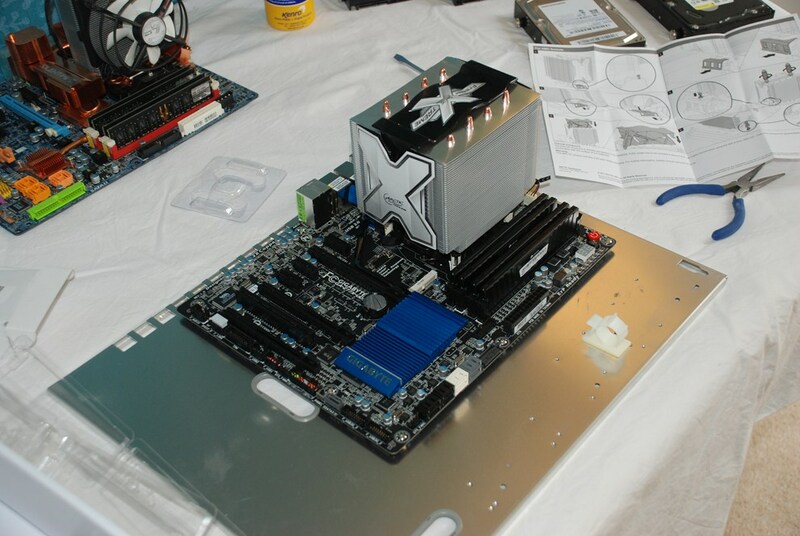 Motherboard tray in place and basic motherboard power. 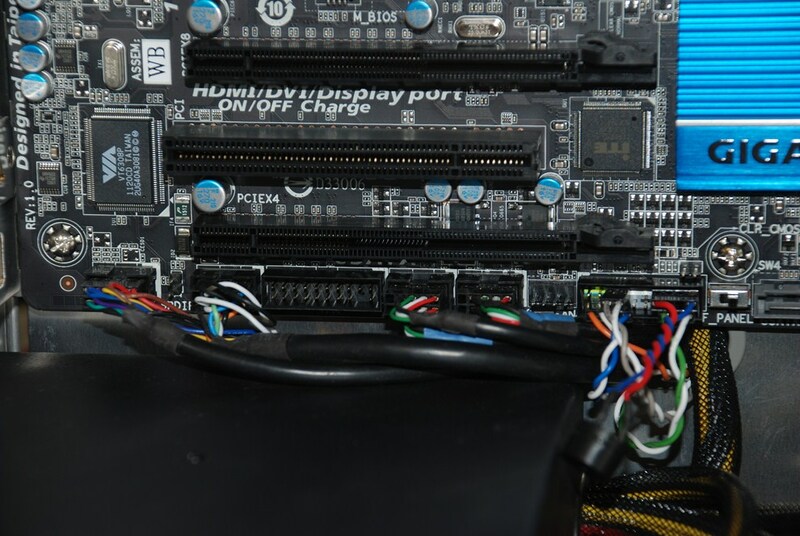 A closeup of all the front panel connectors on the motherboard. All the drives in place. Top to bottom: 128GB SSD, 320GB, 250GB, 250GB, 1TB. More detail of the drives showing the cables a bit more out the way. And finally the rear of the machine. In Brighton we had 50Mb/s download from Virgin Media’s cable service. In the flat in Plymouth we had 5Mb/s download on a good day and on a bad day it hardly seemed worth turning it on. Then we moved to Saltash (other side of the river) and received much the same despite moving to BT Business (for substantially better support). Finally after nearly 3 years of purgatory in the slow lane we have finally been allowed back in the outside lane. All 70Mb/s of it that is. I almost forgot what it was like having an internet connection you don’t have to wait for. Multiple streams of high definition video is a start, but then combine that with services like Google maps where the maps don’t “load”, they’re just “there” and you start to remember what you missed. It is worth noting the upload is not where I think it should be and I will be contacting BT about that, but it is still a metric ton faster than anything else I’ve had. Even I with my job sometimes forget all the benefits speeds like this could bring when delivered to every household up and down the country. Why the government isn’t really pushing this tech as fast as is possible I will never understand. (Oh wait, too busy busting a gut to get HS2 out the door before we don’t need it from all the telecommuting). All I can really say to sum this up is the country could not have these sorts of speeds fast enough. As an aside it is also worth mentioning that Virgin media do actually provide their 50Mb/s service in both Plymouth and Saltash (unusually), however both the places we lived in were developments newer than virgin buying the network and as far as I can tell despite golden opportunities to put in new cable Virgin seem quite content making their existing network ever faster while failing to expand it. More fool them I say. Long time no blog, but no matter, I’m here now. Over the last week or so I have been slotting into place a plan I have had for some time to upgrade some of the core hardware on my computer. Last night this plan culminated in me sitting down to put it all together. 4 Hours later it was done and below are the photos to prove it. Opened up there is a lot more space for cables and disks. 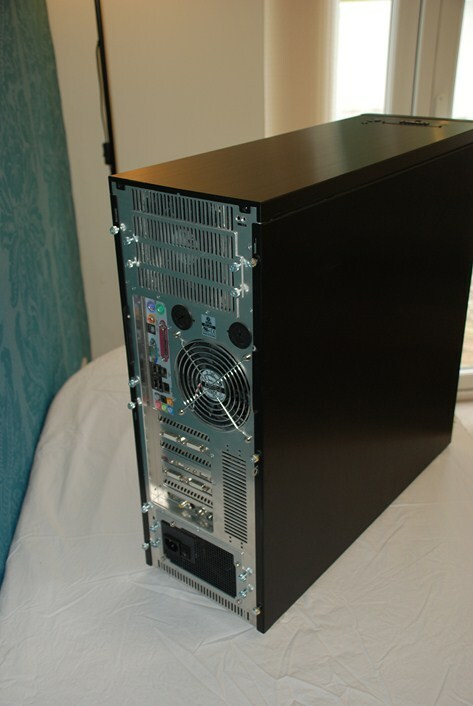 It also has space for the PSU at the bottom which was a big part of my plan to keep good airflow around the CPU. 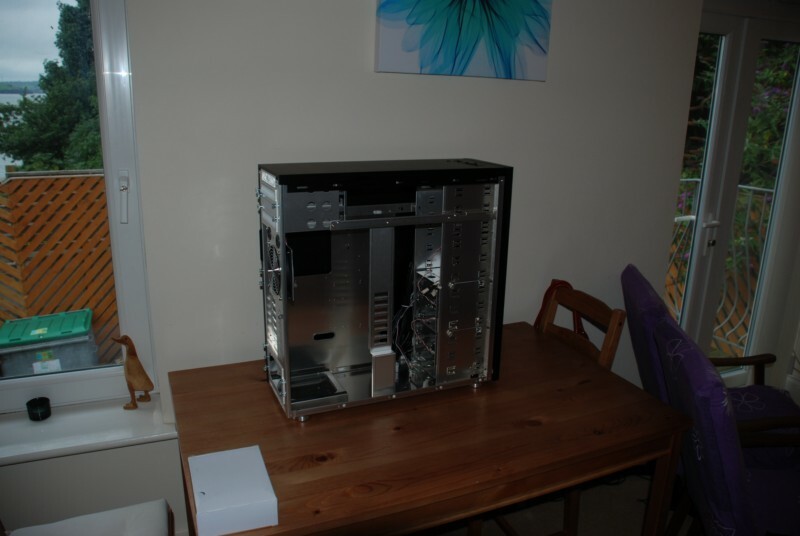 New PSU, CPU cooler, DVD drive and a few cables to go with it all. 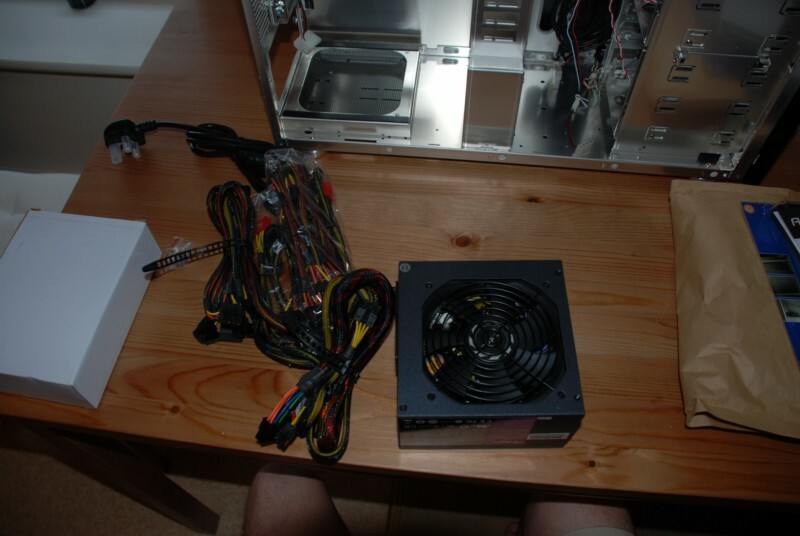 This new PSU is modular (also a part of the plan to improve airflow). 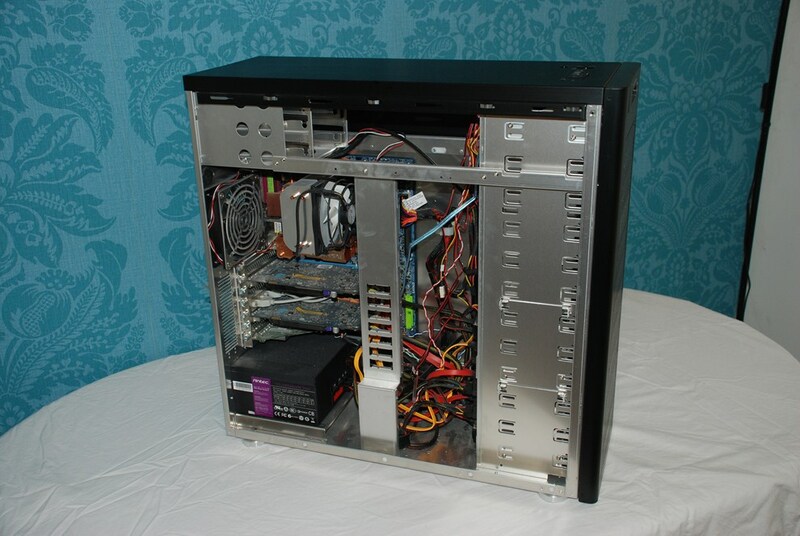 Old case with machine squashed inside. 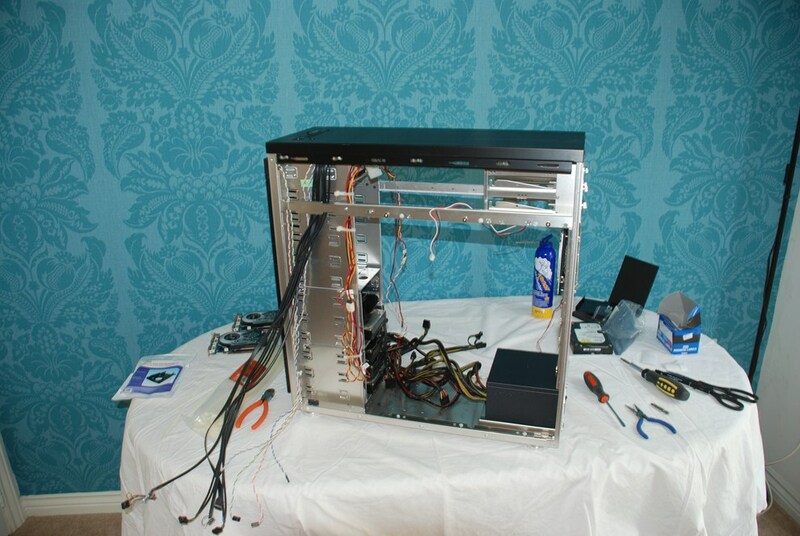 Side panels removed and motherboard tray being removed. Starting to clear out the way some of the cables. 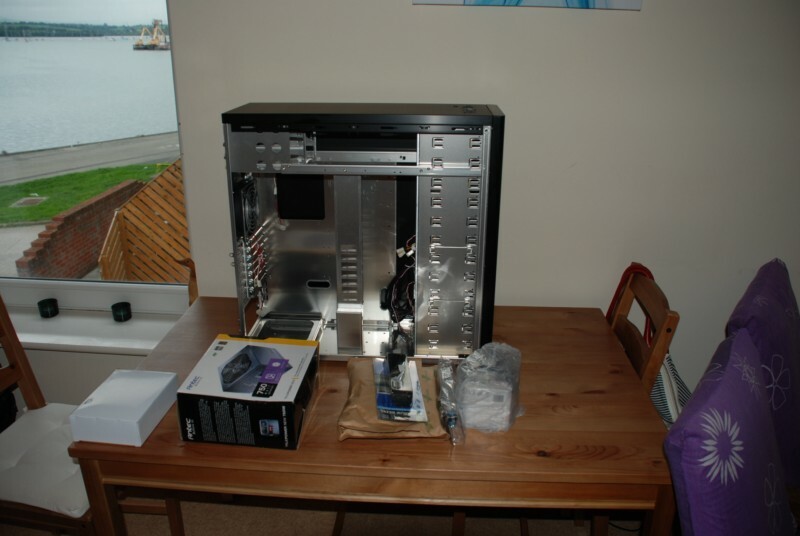 The lounge with the rebuild just starting to step up a gear as I move onto the CPU cooler. 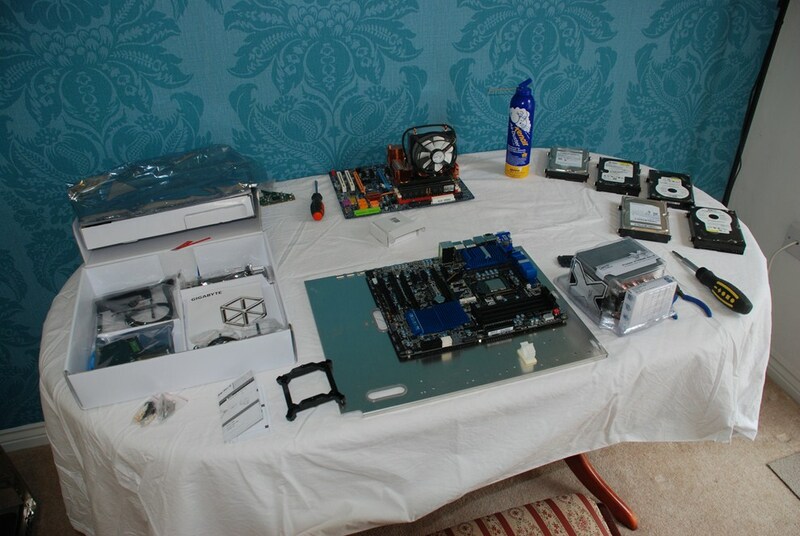 All the bits out of the old case, CPU cooler off and CPU cleaned. Just about to put the new cooler on. Turns out the new cooler was a tight fit to say the least. Note where I have had to cut away at some of the plastic on the fan to get the heatsinks to sit next to each other. Thankfully plastic was not important. 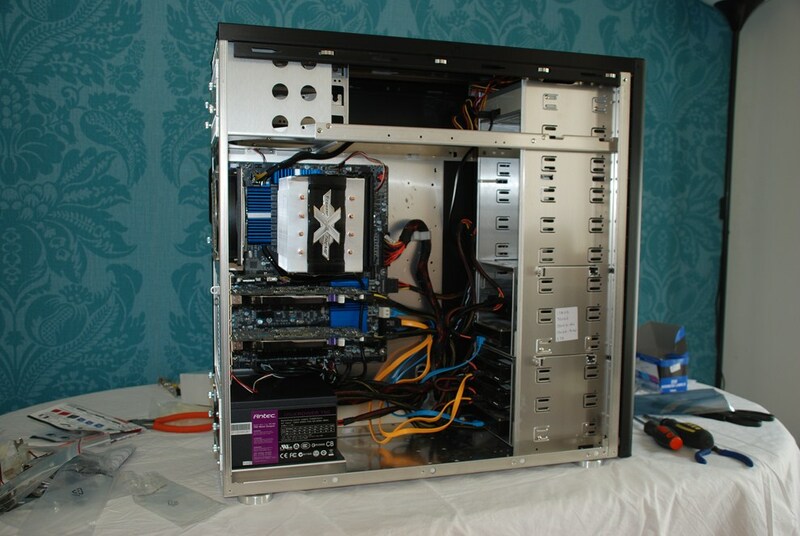 Harddrives mounted in new case. Motherboard tray clipped in, as is the DVD drive. Just starting to do the power cables and alike. All cabling complete. Not a very neat job and there is a lot of room for improvement, but at this point I just wanted to get it all and working. Its new home (note lifted off the floor to reduce carpet dust).